And ya gotta know, I’m not going to leave you high and dry if you don’t have an IP. I have another wing recipe on my site that I love, Thai Chicken Wings and that method will work great with the barbecue flavors of these wings. I’ll put that method in the recipe. below, too in case you don’t have an Instant Pot. Then you don’t have to be paging back and forth if you’re cooking these wings in the oven. And speaking of barbecue, I love that these Instant Pot BBQ Wings are dusted with rib rub (maybe one of mine or your favorite) cooked to perfection in the Instant Pot and then brushed with sauce to be broiled (or grilled if you lean that way) into sticky, caramelized glory. Now me, I think wings, in general, are all right. They’re something I wouldn’t turn down if you get my drift, but the big fan of wings is my son, Kraig. And these def got a big thumbs up from both Kraig and his girlfriend, Tweety. And yup, even me. I think people try to cook everything in their Instant Pots these days, and I do love mine and use it all the time – but there are some things that really shine in the IP. Chicken wings (and ribs, too) are one of those things. With the IP you can cook any wings with precision to the point of absolute tenderness and they render beautifully, juicy and flavorful. Of course, those wings don’t look too attractive right out of the Instant Pot, so this is def a two-step process. You’ll take those sad looking little wings, brush them with your fave barbecue sauce, preferably something a little sweet (I love Sweet Baby Rays) and toss them on the grill or in the oven. That transforms them into a thing of beauty. A tasty thing of beauty! Then, just because sometimes I have to guild the lily, I serve these Instant Pot BBQ Wings with my Alabama White BBQ Dipping Sauce. Talk about taking these wings next level. Get the napkins, wet naps or whatever you need, or maybe just lick your fingers…you’ll have a glorious feast on these wings. The recipe for the IP wings couldn’t be easier. Toss your wings with your rub, cook them off in the Instant Pot and then toss them in the oven or on the grill to carmelize to crispy, chewy deliciousness. I do prefer a smoother, shiny type of a barbecue sauce, just a bit on the sweet side because it will caramelize better. Just choose a barbecue sauce you love and you can’t go wrong. While the IP recipe is super simple, the oven method does require a few more steps, brushing the wings and turning them several times. It’s not hard, it’s just a little fussier, but the results are absolutely worth it. They get brushed, baked and go in and out of the oven, building up that sweet, sticky deliciousness. The deets are in the recipe, below. 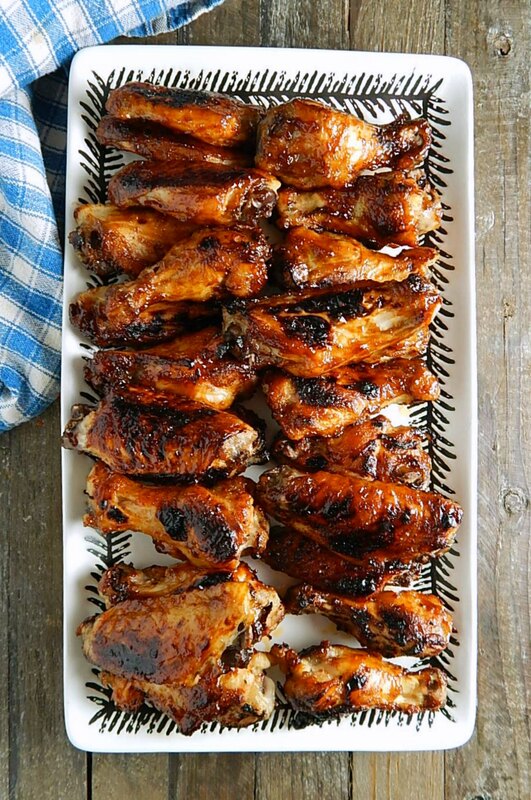 I do think the oven part of this recipe, if you use the oven instead of the grill when you caramelize your wings, or if you are baking your wings instead of using the Instant Pot, is best done on a wire rack. A good rectangular wire rack that fits over one of your sheet pans is a handy thing to have around the kitchen for this recipe and others. It also makes a great cooling rack for cookies or cakes just out of the oven. A while back I wrote a post on Wing Prices – Comparing the Options. Number crunching doesn’t come easily to everyone and wings are one of those items that can be a little mind-boggling with all the different kinds, package sizes, and weights. Honestly, it seems like wings are usually a bit pricier than chicken breasts or thighs. It’s no wonder so many of the commercial enterprises are serving “boneless wings” which are just strips or chunks of either the breasts or thighs. And while some people prefer the boneless wings, there’s something to be said about the incredible flavor and juiciness of the actual chicken wing! Just know what you’re buying and maximize your dollar. Best thing? The stores respond to sporting events so you know they’ll be a sale during the Superbowl (see Superbowl Savings) on condiments like barbecue sauce and on wings and you will probably see a sale or two around March Madness and other events, too. I’ve gotten in the habit of saving any juices from the bottom of my IP to add to any soups or other dishes I might be making; this time, when cooking the chicken wings, the IP juices really weren’t very flavorful; I opted not to save, but that’s up to you. Always give what’s in the bottom of your pot a taste – no sense in wasting flavor! If you’d like to see some examples of my IP recipes, check out my Instant Pot Recipes page. Alabama Dipping Sauce, for serving. Add one cup of water to the bottom of the Instant Pot. Add the rack that comes with your IP. Toss the wings and drummettes with the desired amount of rib rub and add on top of the rack. Seal and set for High Pressure, five minutes. Let release naturally for 10 minutes, then release any remaining pressure manually. To finish in oven: While the Instant Pot is releasing, Line a large sheet tray with foil for easy cleanup. Set the oven to broil, arranging a rack about five inches from the heating element. Pat the chicken dry and toss with 1/2 cup of the sauce. Arrange on the rack, drummettes towards the outside of the rack with the thickest part near the edges, the rest of the chicken in the center. Broil for about 4 minutes. Remove the chicken, turn over, baste the (now) top side of the wings and drummettes with a little additional sauce and broil for an additional 4 minutes. When broiling, watch closely; ovens can vary in temperature. Broil until golden brown with some caramelized spots. To finish on grill: While the Instant Pot is releasing, heat grill to medium-high if using gas; if using charcoal, prepare and start grill when the chicken goes in the instant pot. Remove the wings from the Instant Pot, pat dry and toss with 1/2 cup barbecue sauce. Grill until caramelized on one side, then baste with a little of the remaining sauce. Turn over and continue to grill until the second side is caramelized and browned in spots. Serve with Alabama Dipping Sauce. Preheat oven to 400 degrees F. Line a baking sheet with foil (for easy clean up) and set a rack on top of the sheet tray. Pat the chicken dry and toss with 1/2 cup of the sauce. Arrange on the rack, drummettes towards the outside of the rack with the thickest part near the edges, the rest of the chicken in the center. Bake for about 15 minutes, then remove the chicken and lightly baste the chicken with part of the remaining 1/4 cup of sauce, turn and baste the top side. Place the chicken back in the oven for 10 minutes. Remove the chicken again (and set the oven to broil, arranging a rack about five inches from the heating element) and baste the tops of the chicken pieces one more time. Place in the oven and broil for about 4 minutes. Remove the chicken again, turn over, baste the (now) top side and broil for an additional 4 minutes. Note: the wings may be prepared ahead up to the final basting and the broiling or grilling stage and then finished on the grill or under the broiler when needed. I’ll be sharing Instant Pot BBQ Wings at Fiesta Friday #268. Fiesta Friday is co-hosted this week by Julianna @ Foodie on Board and Angie, herself, who puts on Fiesta Friday! This entry was posted in Click here for Fabulous Food Posts and tagged Appetizer, Barbecue Sauce, Chicken, chicken wings, Instant Pot. Bookmark the permalink. I have no idea what an instant pot is Mollie but if my boys see these for sure they will want us to get one! 😛 We’re only just learning how to use the slow cooker! 😛 Anyway, these sound great and I’ll oven cook them for the boys for now. Thanks for sharing at Fiesta Friday. Oh my gosh, love the Instant Pot which is just an electric pressure cooker. It does have a slow cooker function which I’ve only used 2 x because just about anything the slow cooker does, the pressure cooker does faster! They have even cooler electric pressure cookers that have a browning function, too. I have seen them on tv here, but none of these appliances are cheap! I think your boys would love these! Oh, we have a regular pressure cooker, but not an electric one. Think I might have to investigate! Hoping hubby will bring some wings home tonight so I can make these for them! 🙂 Thanks Mollie. Well, I don’t own an instant pot, but this recipe makes me believe that I may want one! Your wings are making me very hungry! Thanks so much for sharing with us at Fiesta Friday this week! Thanks Julianna! And thanks for hosting for us this week at Fiesta Friday! (oven directions are there too, btw! Omg I’m salivating looking at the glaze on those wings!! I’m so hungry now lol. Thanks Ai!! Hey, I’m looking forward to hosting Fiesta Friday with you next week!! 🙂 Ooops, this Friday!! I love the sound of that Alabama sauce, Mollie. I bet it is amazing with the IP bbq chicken wings. I imaging eating the whole thing. 😀 Thanks for sharing and happy Fiesta Friday! Jhuls, those wings were gone in minutes and we all agreed they were really good but this took it over the top!! Thanks!! Wings in Instant Pot?? You gotta be kidding, HOW?!! There’s a lot of learning I still need to do, obviously. Btw, Mollie, don’t know how to say this but I got totally mixed up. You and Ai were supposed to cohost this week, but instead I wrote on the post that it’s Julianna who’s cohosting, with me. If you don’t mind, can we switch places with you guys. Julianna and I cohost this week, and you and Ai next week? I’m very sorry for the mix up. Please let me know how you feel about switching the weeks. Thanks so much!! Hey Angie! Switching is just fine with me – I’ll do next week! And yes, just cook the chicken wings till tender and broil. They really DO turn out great!! Great! Ai has also agreed to switch and will cohost with you next week. I’ll have to give the wings a try. If they turn out great, you’re a genius!! lol! C’mon you’re AMAZING! I know the ol’ IP gave you a bit of trouble…this is no fail! Just use a sweet sauce so you get that sticky browned caramalization!! You might not wan to share with hubs!! The platter looks absolutely perfect, so the chicken wings have to be delicious!